This indulgent meat-free Wellington makes an impressive centrepiece. With deliciously rich and hearty flavours like mushrooms, chestnuts and goat's cheese, everyone will want a taste! 1. Bring a large pan of water to the boil, add the spinach and blanch for 1 minute. Drain, refresh under cold water then squeeze out as much water as possible. Roughly chop and set aside. 2. Heat the butter and oil in a large pan and gently cook the leeks for 5 minutes until softened and caramelised. Add the thyme and garlic, fry for a further minute then add the mushrooms and fry for 5 minutes more until softened. Remove from the heat, stir in the chestnuts and leave to cool. 3. Tip the cooled mixture into a large bowl and stir through the cheese and spinach. Lay a large sheet of clingfilm on the work surface and tip the mixture into the middle. Mould into a rough log shape then roll up tightly in the clingfilm to make a 26cm-long cylinder. Chill for 1 hour until firm. 4. Preheat the oven to 200°C, gas mark 6. Dust the work surface with flour and roll the pastry into a 34 x 28cm rectangle. Lay the cylinder of filling on top and unwrap. Whisk together the egg yolk and milk and brush along the edges of the pastry. Carefully roll the filling in the pastry finishing with the join on the underside. Press the ends together to seal and crimp with a fingertip or a fork. 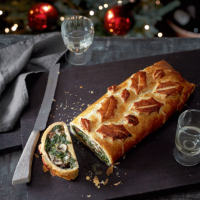 Cut any pastry trimmings into festive leaves and use to decorate the Wellington.Place on a baking sheet lined with baking parchment and brush with the remaining egg. Bake for 30 minutes until the pastry is golden brown and crisp. Leave to stand for 5 minutes before slicing. COOK'S TIPAny leftovers are great on Boxing Day – try serving with a simple salad.